The above is the title and sub-title of a book recently written in English (and soon to be published on www.lulu.com - watch this space!) by Indonesian Kuswanda Wijayakusumah. 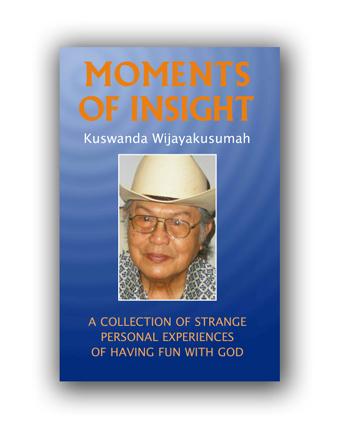 The book contains sixty personal experiences closely related to his Subud life, covering 'Loving', 'Coincidences', 'Just in Time' moments, 'Answered Wishes' and 'Inner Warnings to name just a few. Born on June 7, 1933 in Bandung,West Java, Indonesia. I spent my childhood in several rural towns in West Java, my father being a Dutch Government sub-district official.By the time I was six years old, my family moved to South Batavia and World War II changed the political structure of Indonesia where the Dutch were beaten and Japan occupied the country.My father was then transferred again,this time to a small town in West Java. By the time I was ten, my family moved permanently to Jakarta,the former city of Batavia. I have lived there ever since except during my university years when I spent several years in Bogor,40 km South of Jakarta,and two years in Seattle, USA, where in 1958 I got my Master of Forestry degree from the University of Washington. Arriving home from my studies in America,I joined the small number of teaching staff at the Faculty of Agriculture, University of Indonesia (UI) at Bogor and when it became independent from UI in 1963 in order to become the Bogor Institute of Agriculture, I became the first Dean of the first Faculty of Forestry in Indonesia.I was then 30 years old.My career changed quite often but was never outside the field of forestry and forest industries, including conservation, research and education,as well as the environment. A very close friend of mine tried in vain to see me several times one day because our schedule didn’t match. However, that evening,my family and I left Jakarta for Solo,14 hours drive away. By three in the morning we were already in Central Java,in a small town called Wangon where we needed to stop and get more gasoline. However,a long line of cars was already queuing,as many other people had the same idea,heading back to their hometowns to observe the end of the Ramadan month. I decided to drive on because I knew that there was a small gasstation outside the town in the midst of some paddy fields. My hunch was right,there were not too many cars queuing at thisstation and we joined the end of the line. I asked my son to take the wheel as I wanted to go to the toilet. my eyes. How can such a coincidence possibly come about? God must be playing games with me again. Then I had another insight: that God’s universal authority encompasses all of us. My friend’s wish to see me had been transformed and became a kind of prayer, answered in the most unlikely place at the most unlikely time - in accordance with His Will. moments of insight,which came when the author’s mind was empty and surrendered to the Will of God.The stories related by his friends are similar experiences as received by them and support the theme of this small book – that the power of God enfolds all His creatures and can be felt as His guidance in encompassing their lives. What is necessary when asking God’s help is to ask without expectation! To let God’s omniscience work in its own unique and miraculous way, to have complete trustin God’s love and power.To not interfere with any desires of one’s own and to obtain what one hopes for by wantingnothing,surrendering completely to God’s Will. Those who are spiritually inclined should try out these concepts in daily life and observe what happens,and how – through accepting whatever is God’s Will,and by being compliant – one can be given all that the earth offers us. Because at the end, the adage that “man proposes and God disposes”is true after all.